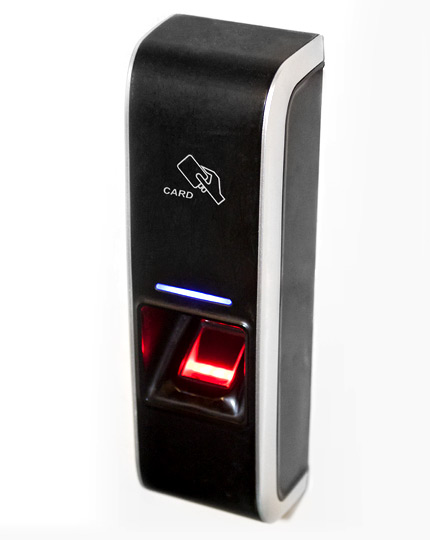 If only the ultimate in Access Control is good enough for you – then look no further than our Biometric and Contactless Smart Card access control scanner. It combines the latest generation Contactless Smart Card electronics with a biometric fingerprint reader for ultimate versatility and security. When a Smart Card is presented to the Smart Card & Biometric scanner, its serial number is transmitted to the main Access Controller that matches it against an existing access rights’ database. Depending on the specific system settings, the Controller can request a further biometric authentication and the user is prompted to place their finger on the fingerprint sensor. A comparison is then made between the live fingerprint and the stored fingerprint template and if the two match, access is permitted. In an elegant case and easy to use, this product is for those who want the absolute peace-of-mind, certainty and the assurance that only the right people can gain access to your sensitive or dangerous areas.